What can happen with printheads when the printer is not turned on for a long time? If you leave your printheads without using them for long time in the printer, it may cause the pigments in the ink to precipitate and generate a "nozzels out" situation. 1- Extract and shake the printheads. 2- Execute the "check and clean"
3- Finally print the "Verify printhead status" plot. 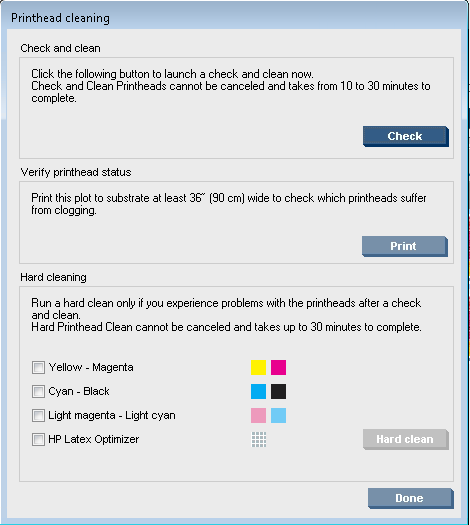 If any printhead was not recovered at all, you should execute the hard cleaning program for the color affected. Coud you please see attached pictures. This is a diagnostic of "Drop detect". The hard cleaning was done a lot of times. The maschine was standing without printing 1.5 - 2 mounth. According this diagnostic i need to change 6 print heads? Am I right? According to the images the color pens seem to be affected. If they do not recover after doing the hard cleaning and the "verify printhead status" plot. You should change PrintHeads affected. Please feel free to contact me if you need any further information.